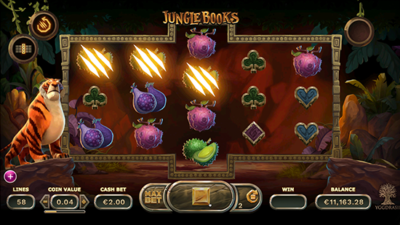 Jungle Books is a Video Slot games from the famous game provider Yggdrasil gaming. The Slot game uses Fusion Realms ™ technology that allows players to switch between five different game modes, each with two separate functions, creating many different ways to win. The Jungle Book has beautiful 3D / 2D graphics and animations. 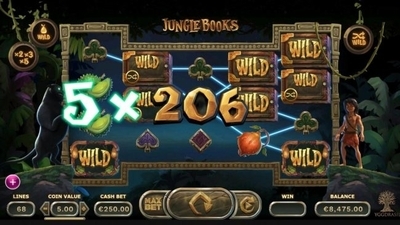 Jungle Books is a 5 reel slotgame with 3 rows and 58 - 68 paylines. the first thing to say about this slotgame is that the gameplay: features and the reel sets depend on the realm in which you’re playing. There are 5 realms and you will know which realm you’re in by which of the five animals stands to the left – the bear (Baloo), the panther (Bagheera), the boy (Mowgli), the tiger (Shere Khan) and the snake (Kaa). The hosts of these realms come and go randomly but the previous host may also appear as a guest on the right hand side of the reels. 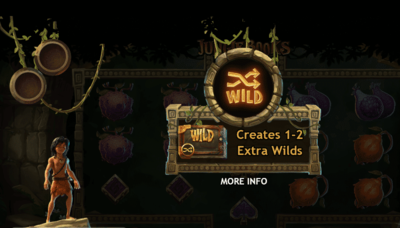 Extra Wilds Wild symbols can create up to two extra wild positions. 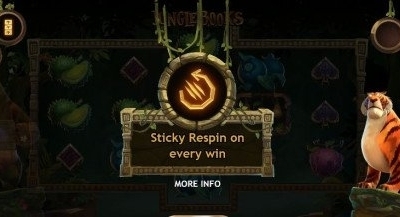 Sticky Respin Any win triggers a free respin with those winning symbols and all wilds held in place, a honeycomb symbol can also trigger a respin. Stacked wilds are added to reel three. Multiplier The golden hanging fruit symbol acts as a a wild. There’s a win multiplier of 2x to 5x.